Following the disappointing debut of Batman v. Superman: Dawn of Justice, audiences worried that Warner Bros. third entry into the DC canon, Suicide Squad, might fall short of expectations. But, by bombarding the world with an expansive advertising campaign focusing on the movie’s humor and unique ensemble, Warner Bros. kept audience excitement high. Upon its release, the film generated more mixed reviews and generally divisive opinions, with some loving Suicide Squad and others extremely disappointed. In my opinion, Suicide Squad may be one of the most unique superhero films to date and the best blockbuster of the summer because of its stellar performances by its top-billed actors, humorous tone and consistent pacing. Director David Ayer’s Suicide Squad follows a group of supervillains assembled into a government strike team, Task Force X, by the aloof Amanda Waller. The team consists of comic book favorites Harley Quinn, Deadshot, Captain Boomerang, Katana, Slipknot, El Diablo and American soldier Rick Flagg. The movie opens with an explanation of each villain’s backstory and the reasons for the creation of Task Force X. When one government asset, the Enchantress, goes rogue, the team is deployed on a classified mission into a city overrun by the Enchantress’ soldiers. The film continues moving from action set piece to set piece, ending with enough of a cliffhanger to leave fans hungry for a sequel. In the movie, the top-billed actors do a phenomenal job in their respective roles; their impressive performances hold Suicide Squad together. In my opinion, Margot Robbie is the movie’s biggest hit as Harley Quinn, a psychotic but hilarious character. Her one-liners and mannerisms keep the movie’s tone lighter than that of Batman v. Superman. Her acting perfectly complements Will Smith’s as Deadshot, an assassin with traces of a moral compass. Other strong performances include, Viola Davis as Amanda Waller and Jared Leto as the Joker. 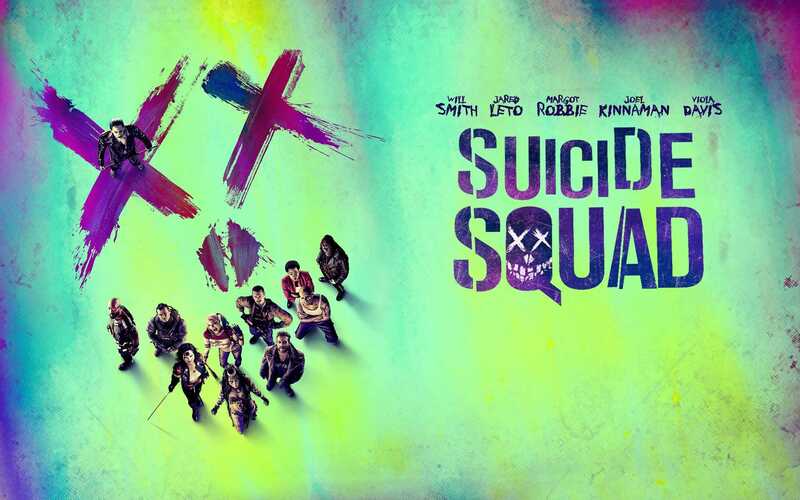 Suicide Squad’s tone is aided by its phenomenal soundtrack- a combination of original songs, including some by Twenty-One Pilots, Imagine Dragons and Wiz Khalifa, and older hits such as “Bohemian Rhapsody.” Though the songs help move the movie between action scenes and lighten the tone, the movie still struggles with transitions; it is clear that some explanatory and transitional scenes were lost to editing. Suicide Squad fall flat because it is burdened by too many characters. The film focuses on Deadshot, Harley Quinn and Rick Flagg for almost the entire movie, often ignoring the rest of the squad. Jared Leto’s Joker appears for only a handful of minutes in an almost irrelevant plot line, even Leto has complained about the number of Joker scenes cut form the movie. Suicide Squad is also plagued by poor acting from the minor members of Task Force X, along with characters such as Killer Croc and Katana who disappear into the background. In addition, though it is a movie about villains, the film lacks true villainy. The characters, who are some of the most notorious villains in comics, behave more like antiheroes, exhibiting a desire to save a world that many spent their lives terrorizing. Even the Enchantress, played by Cara Delevingne, seemingly lacks a motive. Murkiness in the plot and character motives cause Suicide Squad to struggle in critical moments. Despite its flaws, Suicide Squad lays excellent foundations for an expanded DC universe. Amanda Waller, Deadshot, and Harley Quinn are all characters that one can only hope will reappear in future movies. The movie’s even pacing, humor, and overall tone make it a refreshing entry in the superhero movie canon and one of the best action movies of the summer movie season.